Ash Wednesday marks the beginning of the Season of Lent, a season of penance, reflection, and fasting which prepares us for Christ’s Resurrection on Easter Sunday. In our March issue, Father Albert McNally of the Diocese of Down and Connor explored the ‘kaleidoscope’ of light and darkness, life and death that can be found in the Lenten Gospels of Matthew and John. Click here to download or print a PDF of the article, or read the full feature below. Click here for more featured content and resources from our March issue of Intercom. The Year A Lenten Gospels provide us with a fine kaleidoscope from Matthew and John, reflecting the paschal themes of light and darkness, life and death, life through death, the revelation of God’s glory where non believers see only humiliation, baptism through water and the Spirit. Fidelity, Glory: On Ash Wednesday Matthew recommends as usual (6:1-6, 16- 18) the traditional Jewish pieties, prayer, almsgiving and fasting, with emphasis on doing them for God and not for show. On Sunday 1A of Lent Matthew’s focus in the temptations (4:1-11) is on Jesus’ fidelity to the Father and his plan; ‘You must worship the Lord our God, and serve him alone.’ On Sunday 2A we have Matthew’s transfiguration (17:1-9), intended in the Gospels as encouragement to the apostles after the severe shock of the first passion prophecy and the call to disciples to take up the cross. Can God’s Messiah be arrested and executed? The answer is yes: ‘This is my Son, the Beloved. He enjoys my favour. Listen to him … Do not be afraid’. 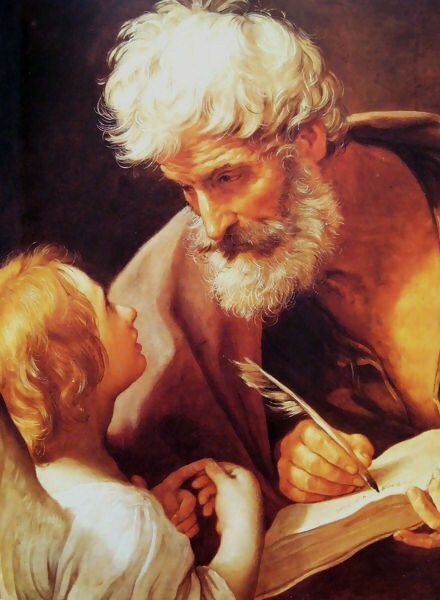 Matthew the teacher directs the Church’s gaze to the words of the true teacher, Jesus, and to the glorious outcome of God’s plan. Living water, light, life: For Sundays 3-5A Matthew is taken off and John comes on as the impact sub. We have 3 of John’s cracking stories, the Samaritan woman (John 4:5-42), the man born blind (9:1-41), and the raising of Lazarus (11:1-45). Jesus offers the woman the gift of living water for her thirst, initially his word, then the future gift of the Spirit (‘the water that I shall give will turn into a spring inside [the disciple], welling up to eternal life.’) See 7:37-39: the living water will be the Spirit, to be available when Jesus is glorified. On Sunday 4A Jesus is dramatically presented as ‘the light of the world’ (John 8:12; 9:5) in the story of the man born blind. The blind man first receives the gift of physical sight, then spiritual (in)sight when he can say, ‘Lord, I believe’ (v.38). This is in ironic contrast to those Jewish authorities involved, who, without this spiritual vision, become increasingly blind as the blind man sees. Our challenge is to see Jesus and his brothers and sisters with new eyes. Sunday 5A brings the raising of Lazarus, the sign of Jesus’ resurrection and of our present and future sharing of the new life of him who is ‘the resurrection and the life’. Sunday 6A brings the passion according to Matthew; on Good Friday we have John’s passion. On these occasions we may reasonably decide that a homily is unnecessary. But we might select a single episode from these narratives to tie together the themes we have already noted. The tone of the two passion stories is quite different. Matthew’s emphasis, following Mark, is on the monstrous suffering of the innocent Jesus, all foretold in scripture, which he frequently quotes, and therefore the faithful fulfilling of God’s plan. John’s is a different world: it is the hour of Jesus where the glory of God is revealed, with emphasis on the fruits of Jesus passion for the life of the Church. God’s true glory is self-giving love, revealed by Jesus’ self-giving on the cross. The Father glorifies Jesus through the cross and resurrection, seen as one event. Jesus is king on the cross, the ‘throne’ on which he is exalted, and which is the source of the new life poured out upon the Church. See the three passion prophecies, John 3:14; 8:28; 12:32, ‘when I am lifted up from the earth, I will draw all people to myself’ (i.e., through the power of love revealed by his lifegiving death). 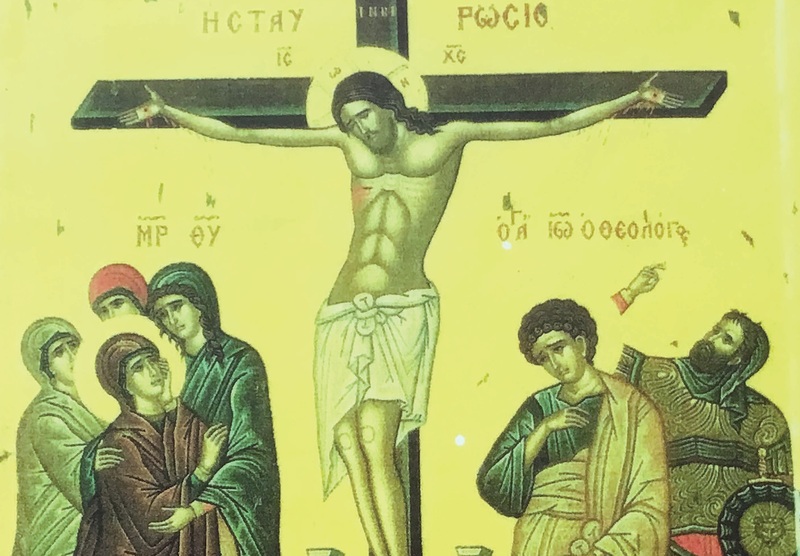 Unless we can convey this colour of John’s passion on Good Friday we may miss the point: Good Friday is the beginning of the Easter celebration, part of the Triduum, the three-day celebration of the resurrection, the link between Lent and Easter. John’s emphasis is not Matthew’s, and yet they come closest in the scene immediately following the death of Jesus in either Gospel. Time may permit the taking of a moment to highlight Matthew 27:50, 51-54, and then on Friday John 19:30, 31-37. Matthew 27: 50 (death of Jesus), 51-54 (the results of his death): ‘Jesus, again crying out in a loud voice, yielded up his spirit’, that is, to God. Then we have the consequences. Matthew likes to use apocalyptic language, often with an accompanying earthquake. He uses seismos, earthquake, for the storm at sea in 8:24, and in 28:2 there is a violent earthquake when the angel comes to roll away the stone. Matthew shows that he does not speak literally by inserting ‘after his resurrection’. It means the power of God at work in these wondrous events, world shaking and life changing. ‘The veil of the temple was torn in two … the earth quaked, the rocks were split, the tombs opened, and the bodies of many holy men rose from the dead, and these, after his resurrection, came out of the tombs, entered the holy city and appeared to a number of people’. The meaning is clear: Jesus’ death is the source of life and resurrection for his followers. The centurion is impressed, together with the other guards (a Matthean touch): ‘having seen the earthquake and all that was taking place, they were terrified and said, “In truth this man was Son of God”.’ Enlightenment, conversion and new life result from the death of Jesus. In John, the death of Jesus (19:30) comes after the momentous event in 19:25-27, where Jesus solemnly inaugurates the new Christian community under the cross. ‘The woman’ (Jesus’ mother as representative of Israel, the people of God), and the beloved disciple, (representing all disciples) are called to be family, God’s family. ‘Woman, behold! Your son.’ ‘Behold! Your mother’. That messianic task accomplished, Jesus can say in v.28, ‘It is ended’, translated literally, for it refers back to 13:1; ‘Having loved his own who were in the world, he loved them to the end.’ Then Jesus death is described in a uniquely strange manner: ‘Bowing his head, he gave up (literally, handed over) the Spirit’; this time to pneuma is to be taken as ‘the (Holy) Spirit, not, or at least in addition to, ‘his spirit’, and he is handing it over to the newly formed Church. This giving is then graphically illustrated in the following verses, which, unusually, the author guarantees to be true and vitally important (v.35). The legs of his accompanying victims are broken to hasten their deaths, but Jesus is already dead, so instead of breaking his legs, they pierce his side with a lance. This is said to fulfil Ex 12:46, ‘not one bone of his will be broken’ referring to the Passover lamb. He is therefore identified as the paschal lamb ‘who takes away the sin of the world’ (John 1:29). The importance of the piercing is further stressed by a second text, ‘They will look on the one whom they have pierced’ (Zechariah 12:10). The stress is on the blood and water that came from Jesus’ pierced side, which certainly symbolise the gift of the Spirit, the living water promised to the Samaritan woman, and very probably the sacraments of Baptism and Eucharist. 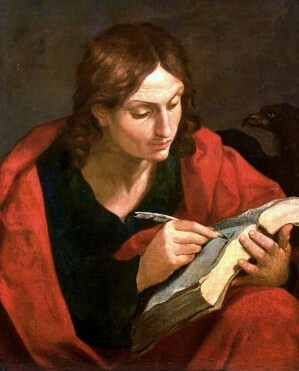 Jesus is therefore the fulfiller of each of our Lenten Gospels, the one who was faithful to the Father’s plan; through whom the light of recognition comes; who hands over the living water, the Spirit, to the Church; and through his death gives life and the promise of resurrection to his followers. We can relate these themes to the Easter Vigil with its celebration of light and darkness, the blessing of water and emphasis on baptism. Our kaleidoscope is represented in art on the icon depicted above, which is an amalgam of John and Matthew: the ‘woman’ and the beloved disciple under the cross, the centurion signalling his faith by his right hand, the spear hand, and the earthquake with the opening of a tomb (a legend had it that the tomb of Adam was on the hill of Golgotha, ‘the place of the skull’). The skull of Adam is washed in the blood of Jesus, representing the resurrection now available to all humanity. It is also interesting that the scene of the piercing of Jesus’ side, which is only in St John’s Gospel, is illustrated in the most prominent position on the great high crosses of Monasterboice, Clonmacnoise and others of the same era, showing the importance of that scene for the Irish monks of the time, the significance of the creation and enlivening of the new Christian community under the cross. Diocese of Down and Connor.